At the site where the Battle of the Little Bighorn began, one hundred and thirty two years later, to the day, on Wednesday, June 25, a new chapter of history was made. Noted Crow tribal historian and Warrior Chief, Dr. Joseph Medicine Crow, was recognized for his military service by both the US and France with two of the highest military awards the two governments bestow. The ceremony took place at the Custer Battlefield Museum's Tomb of the Unknown Soldier. Bestowing the French order 'Knight of the Legion of Honor' on Dr. Medicine Crow was French Consul General Pierre-Francois Mourier. The Knight of the Legion of Honor constitutes the highest of five levels of recognition in the Legion of Honor and places Medicine Crow alongside such past recipients as Dwight D. Eisenhower and Douglas MacArthur. French Ambassador Pierre Vimont said of the award in a letter to Medicine Crow, "...it is a sign of France's true and unforgettable grattitude and appreciation for your personal, precious contribution to the United States' decisive role in the liberation of our country during World War II. The French People will never forget your courage and your devotion to the great cause of freedom." Medicine Crow was then awarded the Bronze Star by Lieutenant General (ret.) Paul E. Funk, a native of Roundup. The awards were presented in recognition of Medicine Crow's army service during the Second World War in the campaign for the liberation of France from the Nazis. The Council General of France, Pierre-Francois Mourier, pins the Legion of Honor medal on Dr. Joe Medicine Crow at ceremonies yesterday in Garryowen. Leonard Bends, Crow-Shoshoni Sundance Leader, gives Medicine Crow a hand during the presentation. 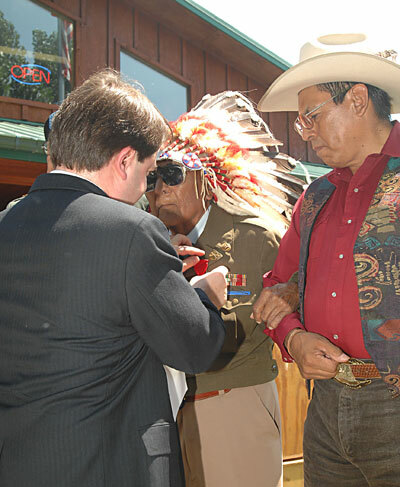 Medicine Crow was also awarded the Bronze Star by Lieutenant General Paul Funk, USA (retired). and friends were in attendance along with well-wishers and representatives from both countries. The US Army provided a special fly-over of a massive CH47 Chinook helicopter. Medicine Crow took the stand and recollected his war service experiences. Of special mention was Dr. Crow's "French connection"; his great grandfather was French-man Pierre Chienne. Dr. Medicine Crow said, "This was a great day for Montana history. I feel very honored to receive these two prestigious war medals." The first of his tribe to achieve a Masters degree and then a Doctorate, Medicine Crow has worked tirelessly to preserve and promote Native American Crow traditions and culture. His noted grandfathers are Chief Medicine Crow and General Custer's scout, White Man Runs Him. Chris Kortlander, founding director of the Custer Battlefield Museum, said “We know that these awards to be presented this day are symbols, serving as marks of recognition from two grateful nations. Symbols can have great power and will be sources of inspiration for those that follow on. Perhaps then, Doctor Medicine Crow is himself a symbol."